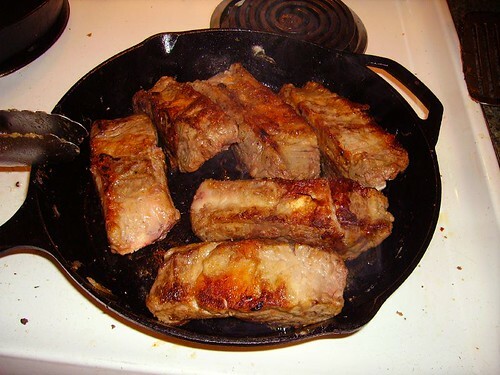 One of the reasons why ribs have always been considered a second-class cut of meat is that, in addition to their low proportion of muscle, they are loaded with connective tissue that makes them tough and chewy when cooked using normal methods. However, it’s this very stuff that allows them to shine their brightest–if you choose the right cooking method. 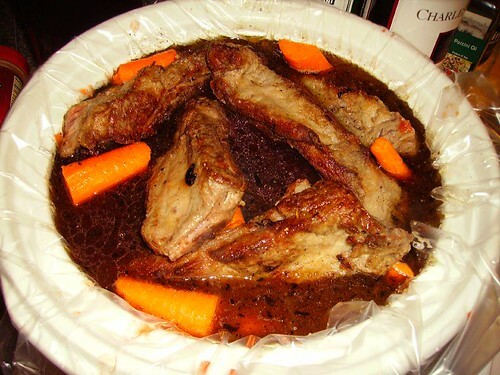 A long, slow cooking process, such as braising or barbecuing, causes the collagen in the meat to dissolve into gelatin, giving the ribs a buttery texture and fall-off-the-bone tenderness. 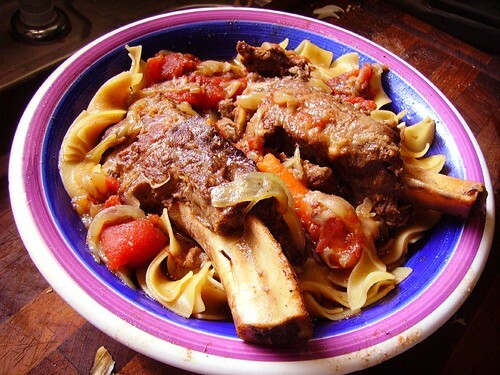 I decided to braise the ribs, rather than barbecue it–thanks to the magic of the Crock Pot brand slow cooker (or any other such device) I could leave the cooking unattended for hours, whereas if I were barbecuing I’d need to worry over temperature and coal lifetimes and whatnot, and I just wasn’t in the mood. Also, this way I could prepare everything the night before, stick the ceramic dish in the crock pot the next morning, and come home to dinner. I decided to start by slicing and sautéing some vidalia onions, because, I don’t know, they were lying around and were probably about to go bad. 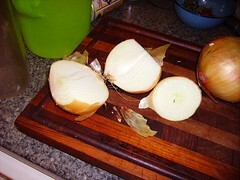 A couple pointers: first, I find it easier to peel onions if they’re cut in half first. This may seem obvious, but I’ve seen a lot of people trying to peel the skin off of a whole onion before they start chopping, which is about as easy as shaving a bowling ball. Second, julienne-slicing onions is not as hard as it may seem. Take your bisected onion and, if you haven’t already, cut off the stem and root ends of it. 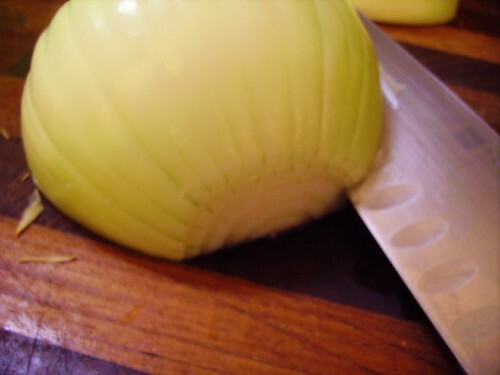 Place the onion half on your cutting board so the big flat side is down, and start cutting into the onion with your knife nearly parallel to the cutting board–your goal is to have the knife hit the cutting board where the center of the onion would be if it were whole. Then increase the angle of your knife and make another cut, and another, etc. After a few cuts you may find the onion a bit wobbly–if it’s difficult for you to handle, tilt the onion so that your next cut is next to a face that’s actually on the cutting board. 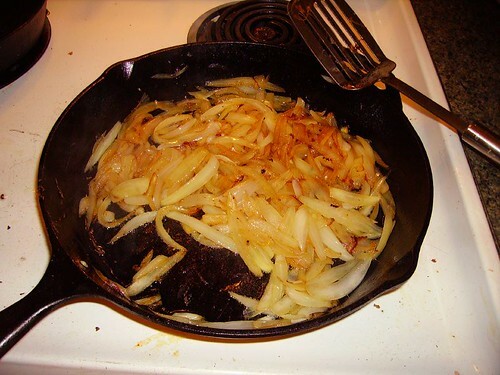 So I julienned two large vidalia onions and put them in a cast iron skillet with oil and salt to sauté. I used a little more oil than I normally would, since part of the purpose of the sauté was to season the oil in preparation of searing the meat in it. Likewise, the cast iron would help to build tasty brown goodness on the bottom of the pan, which I would later use to my advantage. This took a good while–maybe twenty minutes. 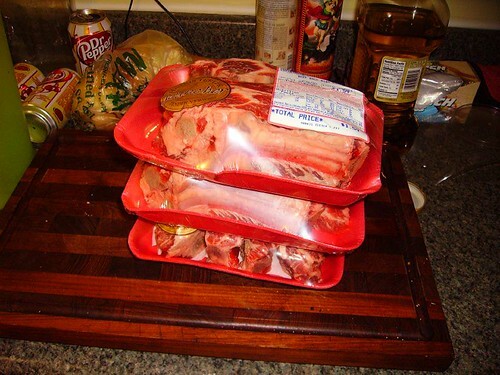 In the meantime, I prepared the ribs. First I seasoned them with a bit of salt and pepper on all sides (the “bony” side could get neglected here, but it doesn’t hurt either). Why bother with the dredging? 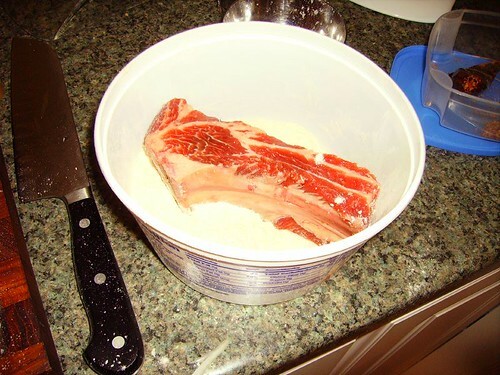 Well, for one thing it helps to make a nicely browned, tasty crust on the ribs. Even though the crispiness will be lost when we braise, the flavor development from the browning will contribute to the flavor of the broth. Secondly, the flour itself will help to act as a thickener for the broth as the flour gets absorbed into it. After the ribs were done cooking, they went straight into the crock pot (along with the onions, which I had put there previously). Now it was time to deglaze the pan. Cooking the onions and the beef had developed a nice layer of browned goodness on the bottom of the pan. In order to extract maximum flavor from this browned goodness, I poured some chicken stock into the pan and scraped the pan bottom thoroughly with a metal spatula. The combination of the boiling stock and the loosening of the browned bits helps to move that flavor into the broth. 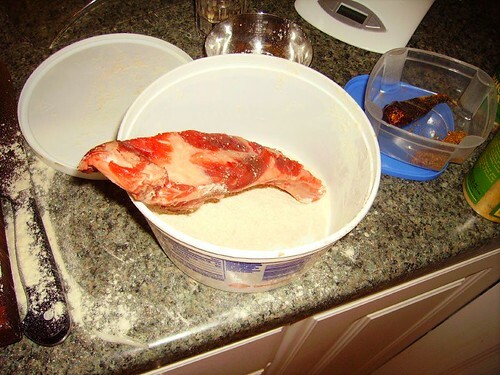 Once I had gotten the browned bits thoroughly dissolved, I moved the broth–you guessed it–into the crock pot. Finally, I added some red wine, a can of tomatoes, and a couple carrots to the pot, covered it, and into the fridge it went until morning. So there you have it. While a bit labor intensive as far as preparation is concerned, the reward is ten hours of not having to care about the cooking at all. That and a flavorful, hearty, and economical (one hopes) meal with a lot of possibilities for modification and creativity. Next > NC State Fair: Do you dare? I am so happy to have found this very well-written, meticulous account of the process. I’ll be trying this out for the guests this coming week. Thank you for taking the time to post this with such detail! I’m glad you have found and like my (woefully inactive) blog! 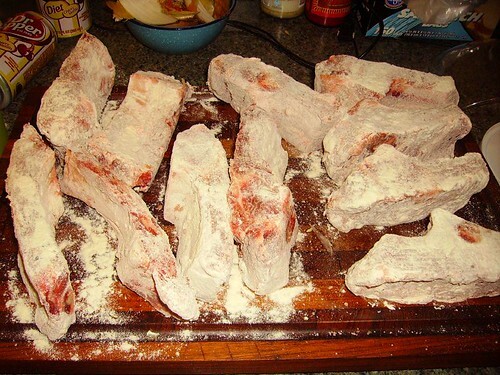 Let us know how the ribs turn out and if you try any interesting variations! Just wanted to tell you what a beautiful blog you have. How lucky to have you in the house cooking up all those wonderful dishes. The pictures are great and your writing is quite humorous. Do you write for a living? You should. Anyway, I hope the recipe worked out for you! And maybe in, I don’t know, another year or two I’ll get around to doing another post. I’m back! I tried this recipe today ( just kept cooking it in the pot on the stove instead). This was so delicious, I will definitely make it again. I even boiled the noodles in the broth ( I would have never thought to do that on my own). It turned out so great. Thanks again!